Is Clothing Market Dying In US ? 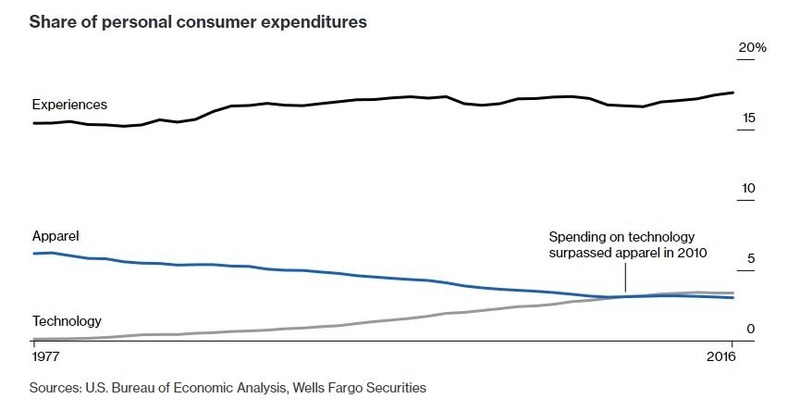 The recent Bloomberg report over the changes in consumer behavior of US customer raises serious questions on the pattern of income spending which seems to be anti-clothing and pro-travel & food . This is an early sign of a big problem for the Apparel Industry. 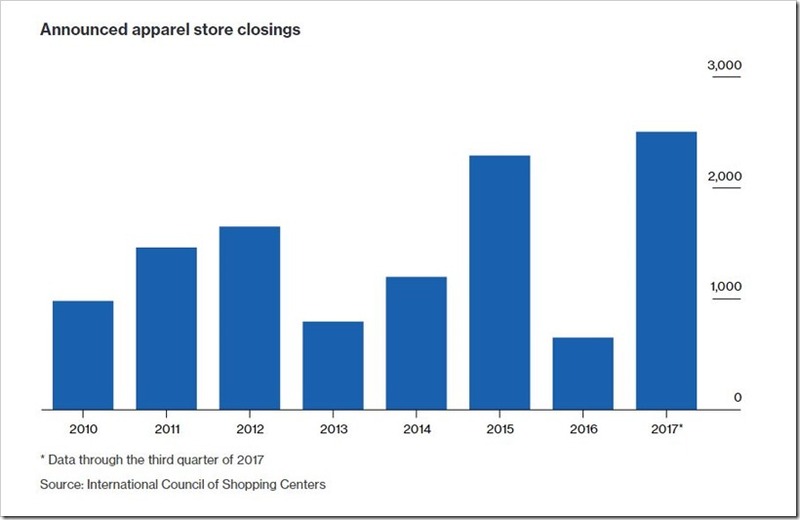 The Apparel Industry in US hasn’t been in a good shape for last few years and that is evident if you look at the number of bankruptcy filled by the Apparel Retailers in US over the years and still counting. Earlier , it has been perceived that due to competition from E-commerce and specially companies like Amazon , the stores have been failing to attract the customers but that’s not the whole story. 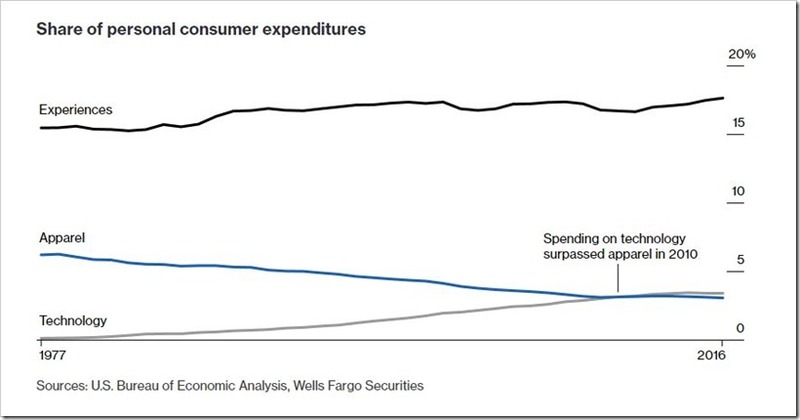 There are just systemic changes happening in consumer spending patterns which is reducing the space for everybody. At a time in late 90’s , the share of clothing spending for US households was 6.2% .However after forty years , the share reduced by 50% to about 3.2% in-spite of the fact that both income and absolute spending by Americans has increased substantially during this period. What went wrong ? The share of Apparel has been eaten up by Travel, Dining out and other adventurous activities which offer more satisfaction to consumer . The expenditure on ‘Experiences’ – mainly Travel and Food -has grown to 18% of spending according to the reports. Apart from that , expenditure on Technology alone accounts for 3.4% of spending which is now greater than that of apparel . The choice and the flexibility to wear any kind of clothing has during most occasions has been one of the reason for the falling expenditure on clothing. There was a time when certain set of cloths were allowed . Formals in the office and casuals at weekends. However with time, companies have started allowing flexibility and then on Fridays’ casuals were allowed and then after some years , casuals took over the formals and are accepted for entire working days by many companies affecting seriously the purchasing of formal wears and this big reduction in one category has affected the per capita expenditure on clothing overall. How Is Denim Doing ? Micro-trends tend to flare up and flame out quickly, leaving larger trends in place for a longer time. Take skinny jeans, which roared onto the fashion scene in 2006 and haven’t left. 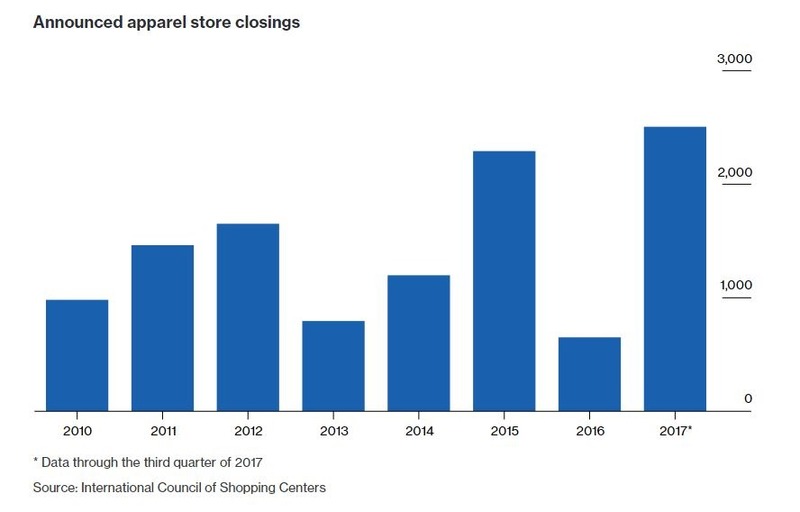 They’re more distressed than ever, but the silhouette remains the same.Companies claiming to be the future of retailing have struggled.When you consider all these varied pressures on the clothing industry, it’s not surprising that apparel store closures peaked last year. This doesn’t simply reflect a shift to online shopping. E-commerce startups were founded to take advantage of the disruption in retail. But even they have stumbled, a sign of the deeper problems plaguing apparel. 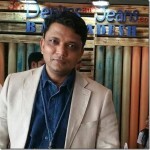 The price of apparel items has been going down as the production cost has reduced due to the shifting of manufacturing in lesser expensive labor markets and being the price competitive in the market for longer term have become the true recipe of success now. 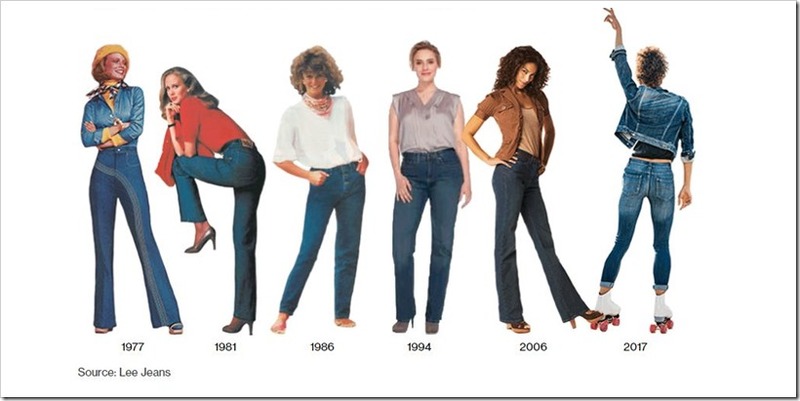 Eg Levi’s 501 original-fit jeans used to get steadily increase its price. However we can see that a pair cost $58 in 2009 in US , then rose to $64 three years later, only to fall back down to $59.50 last year. H&M has proved this with its offering within the range of $25-$35 and has given strong competition to the big retailers in the US . They bring runway looks to the customers at $35 ! H&M growth figures are there but the pace of growth of store addition is at two decade low. One of the reasons for that is H&M is finding its difficult to clear its old stocks which have become out of fashion from its wharehouses. Due to infiltration of E-commerce, consumer are well aware about the latest fashion and hence the company can’t even the sale them at a discount. On the other hand, Blaming Online retailers isn’t the right thing as they themselves are not in the pink of their health . NastyGal went bankrupt last year and many E-commerce companies have sold out to the well known retailers at the end . Walmart bought the famous menswear brand Bonobos last year . However there is one e-commerce clothing retailer which came into market in 2011 and listed itself on NASDAQ in last year in the month of November and gained 34% in its share price , the company name is – Stitch Fix Inc. The reason of its success and survival was the company’s unique approach to deal with their customers .The retailer pairs algorithms and data to select customized outfits for its subscribers, giving shoppers a feeling of personalization and an easy, at-home experience. The same technique is being developed by Amazon also . Amazon has also taken over a software company which is developing such technology which will help the end user to find the best fit . According to the reports, Amazon has invested USD 70 Million in this project (details here). If the share of apparel purchases keeps on around 3% levels in the US , we can expect only shifts from one type of channel / product / category to another . There cannot be much growth expected across all categories. 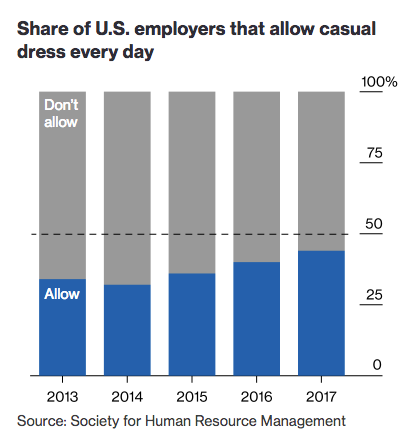 With formal wear usage going down drastically and over 50% Americans saying they can wear casuals to everywhere, it has been good times for casual wear market. However, even the growth in casual wear is not strong considering that the overall expenditure on apparel has gone down drastically. Due to this pressure , the average prices of apparel is , in any case, going down and that is bringing down the margins across the supply chain. The ever increasing consumer awareness about Sustainability seems to be adding to the problem for apparel industry. Increasing information on the harm fast fashion is causing to the environment is reaching the consumers and has been affecting their purchase decisions. Though the number is still small, it is likely to get bigger in coming years adding to the woes of the industry. Its not doomsday yet , but be prepared for tougher times !